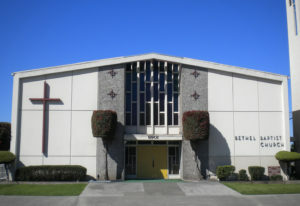 In February 1953, the approval of the Alameda Housing Authority and the Alameda Council of Churches was given for a Baptist church to be organized in Alameda, California. This was the first Baptist church to exist in Alameda, California. The name “Bethel Missionary Baptist Church” which was submitted by the late Pastor, Reverend Herbert Guice (Pastor Guice) and accepted by the entire membership. Over the many years of laboring together God has guided and provided Bethel with continued spiritual growth and influence in the community, city, and county. Bethel has been blessed to have had one pastor, Pastor Herbert Guice for over 57 years, until the Lord called him home to Glory. On February 13, 2008, after 57 years and 8 months of faithful service the Lord called Pastor Guice from labor to reward. On June 5, 2009, the Lord blessed Bethel to elect Reverend Frank Darby, Jr. as Pastor. He was an assistant to Pastor Guice as Joshua was to Moses. Pastor Darby teaches the congregation to keep our focus on Jesus who is the “author and finisher” of our faith, to stay spiritual in our thinking and living; get off the bench and do our part in building God’s Kingdom through personal evangelism. We continue to do the work of God in building His Kingdom, as souls are being saved, lives are being changed, spiritual growth is being experienced, God is being glorified and His Holy and Righteous name is being praised. We thank and praise God the Father for the fellowship with Him through God the Son, our Lord and Savior Jesus Christ and God the Holy Spirit who indwells us and is constantly keeping us in His care.